Inviting Clackmannanshire has some great attractions that are worth a detour if you’re in the Stirling region. The tiny district is a top spot for day trips from the city of Stirling. About 11 miles east of Stirling, in the lower Ochil Hills, is the charming town of Dollar. 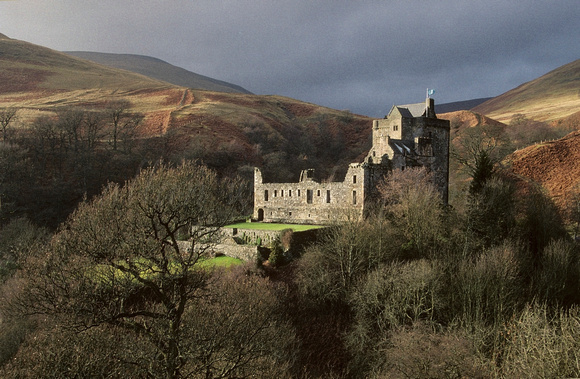 Castle Campbell is a 20-minute walk up Dollar Glen, into the wooded hills above the town. It’s a spooky old stronghold of the dukes of Argyll and stands between two ravines; you can clearly see why it was known as Castle Gloom. There’s been a fortress of some kind on this site from the 11th century, but the present structure dates from the 15th century. The castle was sacked by Cromwell in 1654, but the tower is well preserved. There’s a great ramble with sweeping views over Castle Campbell and the surrounding country from the little car park near the castle. Note that it can get boggy if it’s been raining. There are regular First buses to Dollar from Stirling; other services run from Alloa. This quiet village (you really could hear a pin drop) lies 2 miles southeast of Alloa and has several interesting sights. Clackmannan Stone (Main St) sits on top of a large shaft - it’s sacred to the pagan deity Mannan and predates Christian times. Next to the stone is a 17th-century cross engraved with the Bruce coat of arms; the lower part is heavily worn, due to prisoners’ chains. Also adjacent is the striking Tolbooth, built in 1592 for £284, which served as court and prison. Clackmannan Tower, uphill from the church and about 450m from Main St, was a residence of the Bruce family from 1365 to 1772. In 1787, the widow of the last laird knighted Robert Burns in the tower with the sword of Robert the Bruce. The five-storey tower has structural problems due to subsidence and it isn't open to the public, but the exterior is well worth a look. The idyllic views aren't bad either. Clackmannanshire is a real hidden gem and is worth a visit on your Scotland tours.